A typical combined sewer system collects stormwater runoff, domestic and industrial waste into a single pipe for transport. In normal conditions, the combined wastewater is sent to a treatment plant. However, during especially strong storms or increased runoff due to snowmelt, the amount of wastewater may exceed the sewer system’s capacity. In such cases, the Combined Sewer Overflow (CSO) is directly discharged into nearby water bodies. This discharge poses an environmental and human health hazard, and since the passage of the 1972 Clean Water Act, municipalities across the country have been working to abate their CSO discharge. 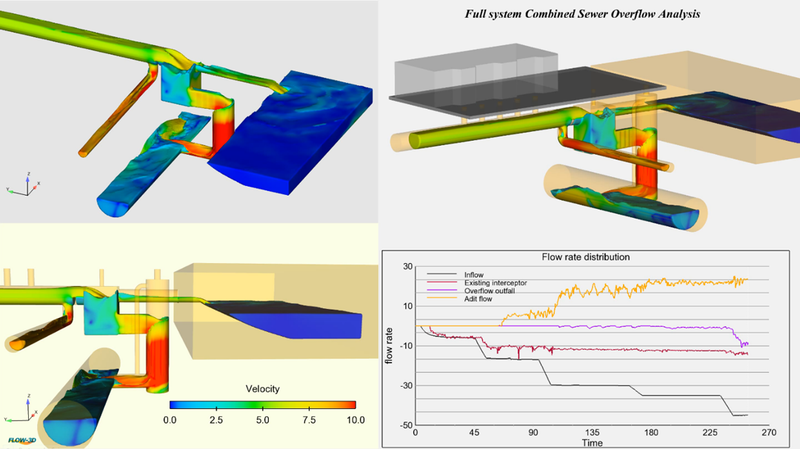 Improving CSO systems entails complex hydrodynamics, complicated geometry, and requires many iterations for an optimal design to limit the overflow to meet regulations. In this blog, I will discuss how FLOW-3D can be used to design or modify complex CSO systems. The illustrated CSO system has two interceptors that sequentially receive the wastewater before an overflow event. If the capacity of the first interceptor is not sufficient, a second interceptor can take the remainder. Sometimes, however, even if the capacity of a CSO is greater than the net inflow of wastewater, overflow can still occur. This may be due to the geometry of the CSO system not accounting for flow characteristics such as bulking. Another aspect of CSO system design is the possibility of the pipes, interceptors or any other part of the system getting pressurized. High pressurization can cause damage to sewer pipes in the short and long term. FLOW-3D can help designers accurately predict the parts of the CSO which are susceptible to high-pressure forces. FLOW-3D’s Volume-of-Fluid (VOF) method for tracking free surfaces, combined with turbulence models, is ideal for accurately modeling CSOs. Additionally, the scalar and chemistry models can help the user understand the changes in the concentration of various waste species in the effluence as it moves from the inlet to the water body. Capturing all the relevant physics in the minutest of details, particularly for large and complex sewer systems, can be a computationally challenging task. For the largest of these problems, FLOW-3D can be run on hundreds of cores using high-performance computing (HPC). It is also possible to avoid the cost of HPC hardware and maintenance by running the simulations entirely on FLOW-3D Cloud. All in all, FLOW-3D provides a comprehensive and accurate set of physics models to design an optimal CSO system in an optimal time frame.